In October, Rick and Rhett Gore took our veteran, David Short on an adventure of a lifetime. They went to hunt at G3 Whitetails in Northeast Oklahoma. Joel Green of Arkansas owns G3 Whitetails. Upon arrival, they were greeted at his very nice lodge. The accommodations were spectacular and the food was even better, but nothing compared to the whitetails he had on the property. The timing was great because the deer were just starting to move with the first cold snap of the year. After several days of hunting, David got his 168” trophy whitetail. Everyone was happy at his success. 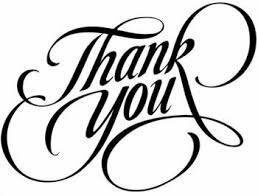 Thank you, Joel Green for your donation. Congratulations to David Short on shooting your trophy whitetail. When I received the call that I had been selected for the Warrior hunt I was shocked and very excited! The trip of a lifetime to go whitetail deer hunting that I would never be able to kill in Arkansas or a lot of other states too. This was early March and deer season was a long time away, so several months passing had eased the adrenalin by late summer when Jim Lee contacted me. He wanted to know when I would like to go on my hunt. I told him that early to mid-October would be good for me if I got to choose the time. I still had no idea where I was going other than Oklahoma, but I figured I would get more information the closer it came to time. When the date was set, I received a call from Rick Gore to set up the details for the trip. I met Rick and his son Rhett Gore at Golden Corral in Conway that evening. After introductions and loading of gear, we were headed for Colcord, Oklahoma, home of G3 Whitetails. Colcord is about a 3-and-a-half-hour drive from Little Rock and is just outside of Siloam Springs, Arkansas. After spending the drive up to G3 getting acquainted with Rick and Rhett, I knew we were in for a good time. We arrived at G3 Whitetails about 9:45 PM and were met by the owner, Joel Green, and his father in law, Jeff Mabry. The lodge was incredible and was very comfortable with everything you would want in a hunting lodge. After visiting for a while and formulating a plan for the morning’s hunt, it was off to bed to get some sleep with hopes of seeing big bucks in the morning. When the alarm went off, I was ready to get the day started and eager to see what the morning would produce in the way of big bucks. The weather had been very hot so far and there had not been a really cool day, so Joel said that we may not see anything this morning but that the evening would be better. We loaded in the ranger and took off for the stand going down the steep terrain and back up to the edge of a field with a large box stand. Joel and I slipped in the stand and got settled in for the morning to get started. The temperature had dropped a bit and it was rather cool in the early morning as we waited for the first hint of light to illuminate the surroundings. Joel and I talked about the military and my deployment to Iraq. We didn’t have to wait very long before a couple of doe had just walked right under us before we saw them. The doe kept feeding along and Joel and I kept scanning the edge of the wood line looking for bucks. I noticed a buck bedded down at the edge of the woods directly in front of our stand. He was a decent deer but even this Arkansas boy didn’t get his pulse racing over him, but it was certainly cool to see. After a little while the buck got up and started to move around a bit. I looked to my left and I see coming out of the woods a ten plus point at least twenty inches wide! Now things are looking up for sure and this guy is only about sixty yards away! I don’t let my excitement get the best of me and Joel looks at the deer and says, “he sure is gonna be a good one next year huh?” I was slowly reaching for my gun and then kind of stretched a little and agreed. Wow, seeing this guy was a game changer for sure and the hunt has only begun. We sat in the stand for a few more hours and discussed what kind of deer I was wanting to get. I have always dreamed of a huge non-typical buck that is not your usual. I told him that I was looking for a deer with character that I just can’t get anywhere. We saw several deer while we visited but no shooter bucks, so we decided it was time for some breakfast. We collected back at the lodge and Joel and Jeff cooked a huge breakfast with everything you could want and more. With the ingestion of this fine meal I chose to relax on the couch and take a little nap and contemplated the evening hunt to come. That evening Joel and I went to another box stand in an area like we were that morning. We settled in and opened windows to let the breeze in because the temperature had certainly risen during the day. We did not have to wait very long before the deer began to move. I noticed a nice buck come out of the woods about three hundred and fifty yards and just lay down. As we looked at him Joel commented that he could be the double drop tine buck he had been seeing. We continued to glass the area and the same ten plus point buck came out again and was followed by a smaller buck. 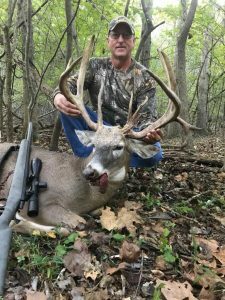 The big double drop tine buck jumped up and took off across the field closing the distance to about two hundred and fifty yards. As I am looking at this buck I can see two drop tines that reach two inches below his jaw and his rack is tall and narrow but very heavy. Joel gives me the word that I could shoot that deer if I wanted too, and buddy I’m here to tell you I wanted too! This buck looked like he had some type of Indian headdress on his head! I could tell he was heavy and tall. Joel said that he would probably score about 180 but that I could take him if he would be alright. “Oh, he is more than alright!” I tell Joel. Joel tells me to let him get closer. Now I am a pretty good shot and I came prepared for a long shot! I said to myself. Joel is the boss and we still have lots of daylight left so we continue to watch and wait. More deer continue to come into the field and I had six large bucks in view at one time. The only problem is they keep getting farther away and not closer in. We wait until dark and slip out of the stand and go to check on Rick and Rhett. They had decided to split up and see if they could kill a monster buck. We got to the stand where Rhett and Jeff were, and we saw them looking at a deer. Rhett had killed the huge non-typical and I have to say it is the biggest whitetail deer I have ever seen in person. I will have to say that I did come prepared for a long shot, but some folks did not. I will leave it there and you can hear the rest from Rhett on the subject. The deer was cut and caped by Joel and their helper Jake in no time at all and then it was time for supper. Let me tell you that these guys know how to feed at G3 let me tell you. Grilled backstrap appetizers, grilled steak, baked potato, salad and all the trimmings. We went to bed with full bellies and I had high hopes for a good morning hunt. After another full breakfast and a completely successful hunt we loaded our gear and headed back home. G3 Whitetails is a first-class operation that is second to none in knowledge and experience plus they are just being good folks to be around. I would like to thank Rick and Rhett Gore for their hospitality and friendship that helped to make this trip of a lifetime memory for me. You guys were gracious hosts and I appreciate everything you did to make this special for me. I would also like to thank the Arkansas Chapter of Safari Club International for the honor of being selected as the 2017 Warrior Hunt recipient. The appreciation of our veterans and their contributions to this nation are to be honored and you as an organization have certainly done this for me.